The year is 2011 A.D. and "Salvation In Trance 2011" - the fourth album of the dance music producer Marc de Simon - is completed after a whole year of intensive work. This album is not just a new release within the series "Salvation In Trance", it is also a milestone and further step of development in the musical career of this young artist. The previous album, which is the foundation to the series "Salvation In Trance", has caused lots of attention and positive feedback of reknowned DJs and radio stations already. This new album in 2011, which is released on Port-au-Trance Recordings, is a consequent further development of Marc de Simon's musical style, which is now more grown-up in terms of sound, arrangement and stylistic elements. There's a clear influence of high-level international trance sounds and productions, which borrows also elements of the genres house and electro. It is intended by the artist Marc de Simon, that exactly this hot mixture of trance, house, and electro sounds also acts as a precursor for upcoming releases in 2012. Find out more here and check out Marc de Simon's page on Facebook: www.facebook.com/marcdesimon now. There you'll find more information, further prelistening streams and video clips. 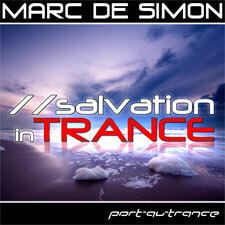 Marc de Simon – New Album "Salvation in Trance" Out Now!!! 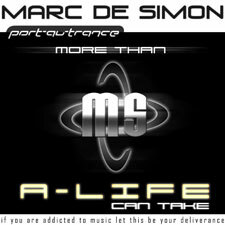 Almost exactly one year after the release of Marc de Simon's previous album "A-Life" the moment has come: On July 27th, 2010 Marc de Simon is releasing his third long player "Salvation in Trance" on the label Port-au-Trance Recordings. The new album contains 14 cutting-edge tracks in a modern trance sound, which are similar to a kind of "salvation" due to their freshness – as the release title "Salvation in Trance" already points out. It's like everybody has been waiting, that someone will come an re-invent trance. All this has been achieved by Marc de Simon without forgetting his typical style through stunning melodic elements, progressive tracks with the potential to become big hymns, and balearic-dreamy elements. Each one of these brand-new tracks, e.g. "Stars of Scandinavia", "Euphoria" or "Reversal of Fortune" can be recognized clearly and instantly when heard as a production by Marc de Simon. The 2010 makeovers of his greatest hits "Rainbow Sky", "Fall And Tears" or "Wings" and "China" as well top-off this album, and they are catapulting his hits into the next decade of the 21st century. Besides a conclusive overall concept for the album itself, the tracklisting has been adjusted very carefully for a perfect flow while listening. The album "Salvation in Trance" is a proof of the constant further development of the artist Marc de Simon, and from the current point of view it is certainly the best work ever created by Marc de Simon so far. Check out the micro site at www.salvation-in-trance.com and Marc de Simon's page on MySpace: www.myspace.com/marcdesimon now. There you'll find more information, further prelistening streams and video clips. Marc de Simon feat. Alesia – "Rainbow Sky 2010" out now!!! Marc de Simon and Alesia are back with "Rainbow Sky 2010"! The first version of this song has been presented to audience in 2006 for the first time and has been recorded and produced again in the first quarter of 2010. The result is pretty impressive. Check out Marc de Simons Website at www.marc-de-simon.com and on MySpace: www.myspace.com/marcdesimon now. There you'll find more information, further prelistening streams and video clips. Just in time with the cold season the remake of "Fall and Tears" with the title Marc de Simon featuring Alesia – "Fall and Tears (2010)" has been released. As seen in the release title, the production is branded by a new female vocal artist, performing under the artist name "Alesia" in music business, definetifely calling even more attention in future. With here voice she provides even more brilliance to the production. "Fall and Tears" has been one of the most favorite tunes for Marc de Simon and his fans, since the initial release on the album "Blend" in 2007. Therefore it was about time for a remake with more contemporary sound and arrangement. To complete the production, a remix competition has been started. From over 30 entries from all over the world, the top seven versions have been selected for you. There is a website ready for this production as well, which can be accessed at www.fallandtears.de now. There you'll find information on the release and furthermore demo versions of the production and remixes. Hamburg, August 4th, 2009 – After more than one year the moment has come: The artist Marc de Simon releases his second album "A-Life". The Hamburg based dance label Port-au-Trance Recordings is glad to be able releasing the follow-up album as well. The album is available on iTunes, eMusic, Napster, AOL Downloads, several DJ portals like JUNO Downloads, Beats Digital or TrackItDown.net and a lot more download stores around the world. Compared with the preceding album, this one goes fundamentally more concentrated into a trance music direction. Especially athmospheric and melodic elements are dominating the foreground. It was quite important to the artist Marc de Simon, that this album would become a very compact and topped-off release sounding like made all of a piece. A deliberate tracklisting and coordinated production of the tracks grants for a continous pleasure of listening. This album, containing 13 new tunes, takes everyone on a trip made of phatt club tracks and beautiful athmospheric sounds. Donny Walsh's "Paguera Beachwalk Chillout EP" out now! Donny Walsh's chill-trance experiment "Paguera Beachwalk Chillout EP" is out now! Available on iTunes, Beatport, Amazon.com, JUNO Downloads, eMusic, Musicload and many more download stores around the world. Donny Walsh, the Hamburg based producer of trance and progressive trance now serves his first chill-out/chill-trance release. It's not a too far step from sounds like trance pads to relaxing chill-out atmospheres. Donny Walsh has always been fascinated of the idea to produce chill-out in a simbiosis with trance, and now he makes his vision come true. 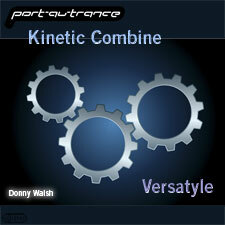 Donny Walsh - Debut Single "Kinetic Combine/Versatyle" out now! The debut single Donny Walsh – "Kinetic Combine/Versatyle" is out now! Available on Beatport, TrackItDown, JUNO Downloads, DanceRecords.com, eMusic, DJTunes.com, Musicload and many more download stores around the world. Donny Walsh, producer of trance, progressive trance and chillout music, lives in Hamburg/Germany. Influenced by trance music, especially of the period from 1992-1996, he starts DJing in the mid-90s. All the time he has his focus on tunes with very emotional melodies and getting forward beats. In the first years he is impressed by artists like Legend-B, Jam & Spoon and Cosmic Baby or stuff from the Eye-Q label. Later on tracks by BT and Ferry Corsten inspire him to create his own music and he becomes a producer. Now his output is ripe for release, debuting with his first double a-side single "Kinetic Combine/Versatyle". Marc de Simon-Album "Blend" out now! The trance album "Blend (Recommended by Klubbers Inc. DJ Team)" by Marc de Simon is out now! Available on iTunes, Beatport, TrackItDown, JUNO Downloads and many more download stores around the world. 1981 born Simon Theophil is the person behind the producer a.k.a Marc de Simon, who is based in Karlsruhe, Germany. Actually he is an educated software developer, but in 1997 he discovered his interest in music production on his PC. Since that time the achievements in music production software have rapidly increased und meanwhile Marc de Simon has found his own style. In the beginning of the year 2004 he got to know further DJs and producers of the German music scene like the Klubbers Inc. DJ-Team, DJ Mindforce or PI-Factor. 2005 Marc de Simon has his break-through with songs like "Rainbow Sky", "China 2005" and "Stars". The album "Blend" is a current draft of his latest works. A lot of the titles contained on this album have been picked for the tops of their playlists from Klubbers Inc. DJ-Team and many other DJs worldwide, therefore this album is recommended to all lovers of best club trance. The Klubbers Productions DJ team frequently rocks the crowd on parties and events, and in such an excessive party mood they sometimes cause chaos and depredation at the DJ booth. They have spun already with a lot of biggies of the DJ scene and have provided greatest trance sound as well on the Dream Dance club tour as on live DJ-sets on "Radio Energy" and "Sunshine live". After several releases and remixes e.g. for Avancada, DJ Cyrus, DJ Teeno + Gavin & Nox or DJ Weichei a lot of DJs and also disco- and party-guests have asked for the productions of the bunch of 5s. Due to so much encouragement this compilation is now on hand and it's available exclusively as download on many music-on-demand portals. The title is predestination, because on this compilation are joined the best club-trance hits of the Klubbers Productions team and a few exclusive, previously unreleased tracks directly from their studios in Karlsruhe. Out now on iTunes, Musicload, mp3.de, plattenladen.tv, djtunes.com, u.v.m. The new single by Ole van Dansk – exklusive download availability. With his new single Ole van Dansk walks on new paths and provides warmer, Ibiza-style trance sounds for the first time. Furthermore he serves a groovy electro remix of this track. Now Ole van Dansk performs an evolotion as solo-artist, which has happened at DJs@Work already, of which he is an essential part of. Big club tune on international level. Available right now from: iTunes, Musicload, www.mp3.de, u.v.m. Ole van Dansk, reached many chart successes as a member of DJs@Work and won the VIVA Comet 2002 award with this dance act. On solo paths he also had respectable success with his solo-singles "Shining Star" and "How I Wish", which especially caused furore in the canadian and japanese charts. The born Dane proofs, that successful trance may come from Germany as well. With 5 brand-new, exclusively and only as download available tracks on his "Massive Trance Collectibles-EP" Ole van Dansk sets a new mark in the trance scene... This download-EP is in store now here in our download shop and from September on worldwide on Apple's iTunes and many other download platforms.